According to the National Confectioners Association, $2.1 billion of Halloween candy was sold in 2004, an increase of 2.4% from 2003. Then in 2005 the sales went up 2.3%. Then in 2006 the sales went up 2.8%. How much Halloween candy was sold in 2006? A carton of a dozen organic eggs costs $2.30 and weighs 25 ounces. How much is this in dollars per pound? Our classroom is about 9 yards wide. If I walk backwards heel-toe-heel-toe as fast as I can, it takes me 7 seconds to go those 9 yards. What is this speed in miles per hour? A certain family eats 3 pints of ice cream every 5 days. How many gallons per year is this? We begin our topic of measurement unit conversions with a definition. A measurement's unit is the word that labels the measurement. I am 63 inches tall. The measurement unit is inches. By convention we use plurals of such words when talking about units. A large box is 1 yard tall. The measurement unit is yards. Note that some measurements have two units. A speed limit is 30 miles per hour. The measurement units are miles and hours. There are measurements that use more than two units, but in Math 20 we will not encounter anything this complicated. As one example, thinking carefully about a 20-watt light bulb requires considering six units! A watt is the rate of power of moving a weight of one kilogram at a speed of one meter per second when resisted by a deceleration of one meter per second per second. Where did we get our measurement units? The older system of units from Europe is now named Standard, American, or Imperial units. The newer system is named SI units, but most people still call it by its older name, the metric system. We'll start by talking about units for measuring length. Many European countries used lengths named the "inch", "foot", and "yard". European historical records from the twelfth century show much more care in measuring the inch than the foot or yard. Apparently a town would measure an inch by taking the average value of thumb width of a few men, which produced a result that had little regional variation. Carpentry and other crafts needed a standardized inch more than a foot or yard. Having twelve inches in one foot was a remnant of the Roman Empire. So a foot was always twelve inches. This was much longer than nearly everyone's feet, but could be estimated by stepping heel-toe heel-toe in boots. For many centuries a "yard" meant many things in Europe. The common theme was that a yard was about a stride length. In different places a yard was either three feet, average waist circumference, or two cubits (elbow to elbow when touching fingertips). In places that based yards on feet, a yard as always three feet. The metric system was created in France, beginning in 1791. In 1793 the French Academy of Sciences adopted as the country's official unit of length a meter, defined as one ten-millionth of the distance from the Equator to the North Pole through Paris. How long was this meter? It is the same meter we use today. The expedition sent to measure this distance was only off by by one-fiftieth of a percent. This was remarkable accuracy considering the technology available then! But it does mean the meter we use is not quite the originally intended length, so people felt free to adjust the definition in later years. In 1889 the first General Conference on Weights and Measures established a new definition. This group built an International Prototype Metre: a bar composed of an alloy of ninety percent platinum and ten percent iridium, marked with two lines whose distance apart was measured at the melting point of ice. The purpose was to keep the same length but have a physical example that could be easily copied by anyone visiting Paris. Many of the rulers we use have one side with inches and feet, and the other side with centimeters and millimeters. Can you look at such a ruler and see that one inch is about two-and-a-half centimeters? Interest in redefining measurement units for length resurfaced in the late 1950s. Since the meter had a proptype but the inch did not, in 1958 the inch was redefined as exactly 2.54 centimeters. In 1960 the meter was redefined again, this time as 1,650,763.73 wavelengths of the orange-red emission line in the electromagnetic spectrum of the krypton-86 atom in a vacuum. This definition again aimed to keep the length unchanged while creating a physical example that could be duplicated almost exactly by anyone, anywhere in the world, with common laboratory equipment. In 1983 the meter was redefined for the last time. Now it is the distance traveled by light in free space in 1/299,792,458 of a second. This final definition again kept the length unchanged, and finally created a physical example that could be duplicated exactly by anyone, anywhere in the world, with common laboratory equipment. Much easier and less expensive than visiting Paris to measure a metal bar! The Roman Empire used weights from which we get the words "pounds" and "ounces". After the Roman Empire, an ounce saw various definitions across Europe, usually 450 or 480 grains of barleycorn because that grain is very uniform. The Roman pound was 12 ounces. But soon after the Roman Empire ended, most European merchants switched to a sixteen ounce pound. 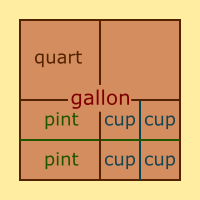 For the metric system, a gram was defined as the mass of one cubic centimeter of water. This is a small amount! It is useful in the laboratory, but not as practical for commerce. So 1,000 grams (a kilogram) is used more in normal daily life. As an aside, scientists use the word mass to denote how much physical stuff an object is made up of. This is different than weight because it is independent of an object's location. The weight of an object changes proportionally to the local gravity. The moon's gravity is one-sixth as strong as the Earth's gravity. If I weigh 152 pounds on Earth, how much do I weigh on the moon? Volume was not used much until the eighteenth century. A standard size bag was much more difficult to measure, let alone construct, than a standard length rod/cord or standard weight of barleycorn grains. For most of history, volume measurements were not used. When they were used, they were merchants' jargon for the volume taken up by a certain weight of a certain trade good. For example, a gallon was originally the volume of eight pounds of wheat. In modern times the volumes of the American/Standard/Imperial system have been standardized. Bakers and canners might have the advantage of already knowing these conversion rates by heart. Since a gram was defined as the mass of one cubic centimeter of water, that same size cube was used to define volume in the metric system. A milliliter was defined as the volume of one cubic centimeter. Note that some professions use "cubic centimeter" or cc instead of milliliter. A milliliter is pretty small! So the liter (1,000 milliliters) is the size more appropriate for most practice uses. Lots of math problems from earlier in the class used measurement units, but only as labels to keep track of and append to the final answer. Our new task is to "convert" between measurement units. Sometimes this is easy and can be done with the tools we already have learned. We will examine that situation first. A one-step unit conversion is when we switch a measurement's unit and we know the rate that compares the old and new units. This problem is a one-step unit conversion. How many inches is 7 feet? Here is a nice memory aid. When converting units from larger to smaller units (i.e., miles to feet, or gallons to quarts) then multiply. When converting units from smaller to larger, divide. Unfortunately, life is not always so simple. This problem is not a one-step unit conversion. How many inches is 7 miles? Most people do have memorized the rate of inches to miles, so this conversion will require more than one step. We can use a proportion to do a one-step unit conversion. As a class you can figure out how to use those old tools (making and solving a proportion) for a new trick (a one-step unit conversion). But we cannot use a proportion when the conversion requires more than one step. Why not? Let's talk about this while looking at an example. Is it clear why the old math we know is not enough? We need a new technique. In real life many unit conversions require more than one step. However, almost all the homework problems in the textbook are only one-step unit conversions. If Math 20 is your last math class, you can get by with using proportions for unit conversion problems. The second midterm and final exam will only have a few problems requiring more than one step. But to be better prepared for real world problems and math classes beyond Math 20, we need a new technique. Turn to page 468, the beginning of §8.1. Notice there is a purple box that has all of the section's conversion rates. You will eventually be asked to memorize some of these unit conversion rates. But for now only worry about memorize the parts of a gallon, which is described next. 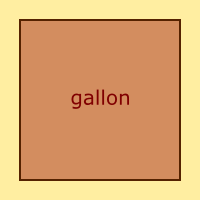 Is there an easy way to remember the parts of a gallon? You betcha. If we chop it into fourths we get quarts. 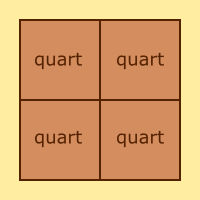 The name quarts is like "quarters". Each quart is two pints. Each pint is two cups. Think about two short one-cup milk cartons stacked on top of each other to become the size of a one-pint carton of whipping cream. Some students prefer to combine all of those diagrams into a single, more complicated picture. Why do people say "Mind your p's and q's"? Pubs in England used to give credit to regular customers. People would only get paid once per month, and in the meanwhile the bartender would mark p's and q's (for pints and quarts) below their name on the wall behind the bar. At the end of the month this record would show what they owed to bar. So "Mind your p's and q's" meant "Don't drink too much before payday!" We begin our topic of square roots with a definition. The square root of a number is the amount that, when multiplied by itself, gets to that number. 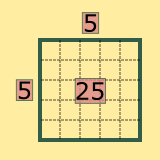 It is 5 because 5 × 5 = 25. We usually write square roots with a symbol. But do not forget the definition just because you are looking at a symbol! Find the square root of the following numbers: 2, 4, 6, 8, and 16. Why are two of those answers whole numbers? When we multiply a whole number by itself, we call the answer a perfect square. Perfect squares have nice square roots. When 144 or less, they are easy to find with mental math because we have memorized our multiplication table up to 12s. Chapter 9 Test, Problem 28: What is the square root of 225?